On Saturday 4 October 2014 Axia Vegetable Seeds BV, a young seed company based in Naaldwijk, The Netherlands, opened her doors for an international delegation of the Agricultural Biodiversity Community, with farmers and breeders from Asia and Africa. The event was part of a ‘Food Safari’, organized by the Youth Food Movement and the Hivos-OxfamNovib joint knowledge programme on agricultural biodiversity. 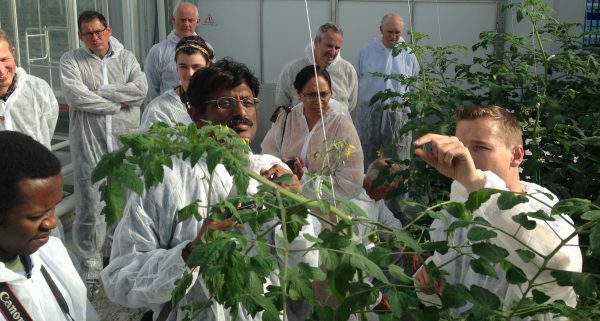 Axia gave a guided tour through her greenhouses of Axia: state-of-the-art in-house research and development facilities to create the ideal circumstances to breed new hybrids. Especially for the farmers and breeders from Africa and India, it was interesting – some called it a ‘culture shock’- to see the sophistication in the breeding process. For members of the Access to Seeds Index team that participated in the Food Safari, it illustrated the challenge of the Index to build a bridge between the worlds of the smallholder farmer and the seed industry.